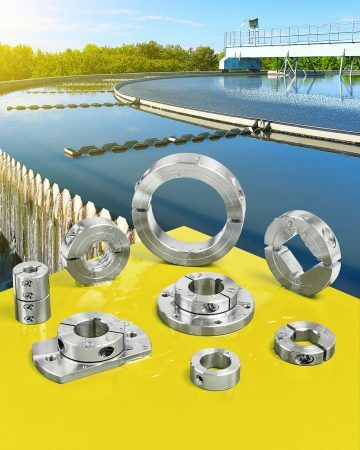 Standard and custom machined parts made from corrosion-resistant 316 SS for use in wastewater treatment facilities and similar harsh environments are available from Stafford Manufacturing Corp. of Wilmington, Mass. Stafford 316 SS Shaft Collars and Couplings are available off-the-shelf and as custom machined special parts designed for use with mixers, pumps, and flow control systems. Featuring custom components such as couplings or mounts for different types of pumps, these parts are ideally suited for exposure to the harsh chemicals found in wastewater treatment plants. Supplied in prototype through production quantities, Stafford 316 SS Shaft Collars and Couplings can incorporate bore features such as hex, square, round shapes, keyways, or threads. Exterior modifications can include flats, slots, knurls, laser etching, tapped through-holes, flanges, cams, and levers. Bore sizes can range from 1/4” to 12” I.D. for collars and 1/4” to 4” I.D. for shaft couplings.